New Delhi, March 21: The pilots of financially-strapped Jet Airways have urged Prime Minister Narendra Modi and Civil Aviation Minister Suresh Prabhu to intervene and instruct the management to release their pending salaries. "We fear that the airline is on the verge of collapse. This will leave thousands of people unemployed. 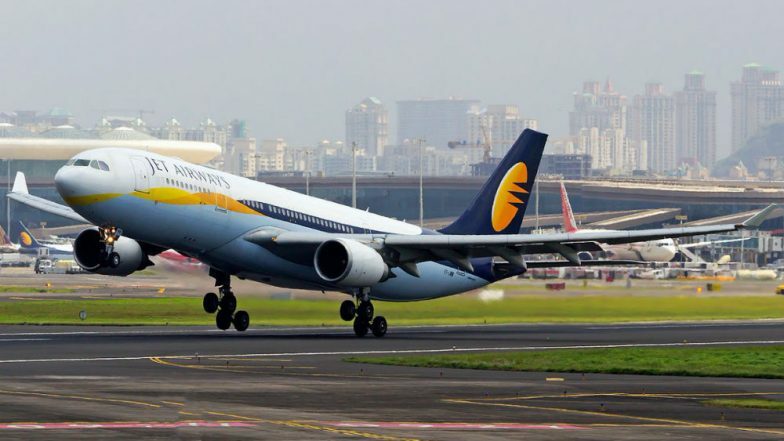 It will change the dynamics of aviation as fares will increase due to a reduction in capacity, and travelling public will face major inconvenience," said the National Aviators Guild (NAG), the registered trade union of Jet Airways' Indian pilots. Two days ago, they had threatened to stop flying from April 1 if their pending salaries are not cleared by March 31. While the airline is going through a tough financial phase, all employees except for pilots and engineers are getting paid on time, claimed the NAG in communication to Modi and Prabhu. "The pilots and engineers are now almost three months behind salaries and facing a lot of financial hardships with no relief in sight. Our repeated pleas to the management have gone unheard. The pilots have maintained professionalism and not hampered operations of the airline as that would have had a catastrophic effect on passengers' travel plans," read the letter. Naresh Goyal To Step Down as Jet Airways Chairman as Airline Accepts Etihad's Bailout Plan Terms And Conditions. Naresh Goyal-led Jet Airways is facing the worst financial crisis of its 25-year existence with more than one billion dollars of debt. As it struggles to stay aloft, the carrier has delayed payments to banks, suppliers, and aircraft lessors some of which have begun terminating lease deals. The airline is reportedly down to operating 150 flights a day from 450 at full capacity with a third of its 12-plane fleet grounded. Jet Airways to Suspend Flights to Seven Gulf Countries, Fly More Planes From Delhi & Mumbai. The state-owned banks have been working on a resolution plan to bail out the debt-laden airline. Jet is also in talks with Abu Dhabi-based Etihad -- its majority stakeholder -- to secure a rescue deal.The NAG said the continued uncertainty and financial difficulties are causing extreme stress among pilots and engineers that can easily compromise safety which is not at all desirable.